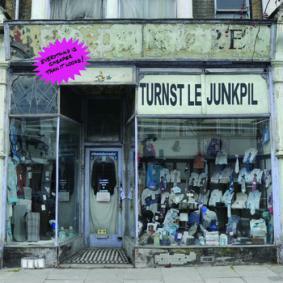 This debut album from the wonderfully named Turnstile Junkpile is recorded proof that retro can be progressive as they have created a piece of real deal Americana in the true spirit of Parsons mission to fuse and Van Zandt’s intention to provoke thought. There is no denying that ‘Everything is Cheaper Than it Looks’ is an unashamedly attempt to rekindle the flame of ‘Cosmic American Music’ but the timeless quality of this style towers above many other music forms and still retains a strong relevance today. The four-piece London based band named after the Townes Van Zandt song ‘Turnstyled, Junkpiled’ is led by Mat Clark and capably assisted by colleagues Lawrence McNamara, Ben Sumner and Dave Shaw on the usual array of string and percussion instruments you would expect on an album like this. Banjo and the twin steel sounds of pedal and lap, combined with that of standard guitars will always enhance a recording when played well and there is ample evidence of this being the case on this rookie release. Another reason for the appeal of this mini album is the thought provoking lyrics, all originally self –penned by Mat Clark, that let you draw your own interpretations without consisting of a load of pretentious claptrap. The seven track album launches into life with the up-tempo number ‘Time is Running Out’, a quality opener which could be construed as addressing the issue of mortality. There is definitely more of a rock feel to the second track ‘This Isn’t What We Signed Up For’ especially with some of the guitar solos which assist a song appearing to evaluate a feeling of frustration. The slower third track, ‘Wishing Well’ is fast becoming one of my personal favourites and this country flavoured song which makes comment on those using faith to take short cuts demonstrates the effective use of banjo and steel. The banjo, that much maligned traditional instrument, supplies the opening bars to the jaunty number ‘How How How’. This song explodes into life in the latter stages with the powerful rhythm and blues sound emanating from a combination of harmonica and banjo. ‘Zanzibar’ has a more conventional rock sound with a leaning towards the influences of the southern states while the banjo-led sixth track ‘In the Morning’ is a tale of seeing things in a different light served in a slower folk style accompanied by some delightful steel and effective backing harmonies. The closing and title track ‘Everything is Cheaper Than It Looks’, once again has the banjo featuring subtly in the background with the lyrics painting a vivid image of retail in a bygone age. Without any reservation this is a fine album and hopefully the positive reaction it will surely receive will inspire the band to further develop their creative talents in a continued alt-country/Americana direction.